Irit | Cards & More! 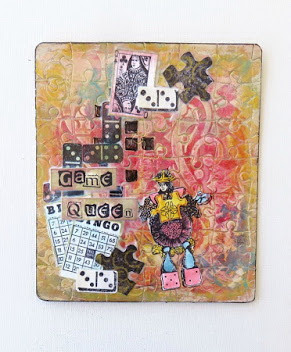 Hello my dear crafty friends and welcome to my final post as Rebecca Baer's DT member. It was great time on this team and I really adore all delicious stencils I used. So in this post I decided to show you all projects I made with Rebecca's stencils and not posted in her blog. I made those projects for other design teams or just in case. I used Rebecca's stencils on all of those projects and most of them even have full tutorials in my blog that I am going to link here. So please welcome those projects and get some final stencil inspiration. The first one is a mini book with full tutorial and I used Marakesh Small stencil for the cover. I know that not much is seen after the cover was embellished, but you still can feel the great dimension of this cover because of the stencil use. And here is a full tutorial link to this project. I add one single photo with the stencil to show you here too. 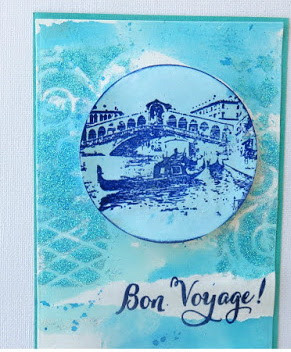 Here is a card that I made using Rebecca's Snow Flurries Small stencil as the background and it's also with a full tutorial here. The next one is an art page made with two stencils and a full tutorial again here. 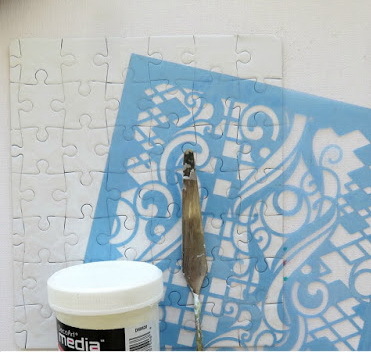 And now for the puzzle art board made with one of my most favorite stencils- Mosaic Medium one. Again, there is a full tutorial here for you to see. This Mixed Media card was already in print in Scrap N' Stamp arts print magazine and yes, Enchanted Vine stencil is a star of this card. So as you can see you can do whatever you want with those fantastic stencils: mini book covers, cards, altered art and actually the sky is a limit. I want to thank Rebecca Baer for the lovely time on this team and for her best ever stencil I am going to use more and more in the future. See you all over the virtual land!